Benjamin Brown French was born in Chester, New Hampshire on September 4, 1800. He was a lawyer by profession and was Assistant Clerk of the State Senate of New Hampshire. He was later elected to the New Hampshire State Legislature. While in the Legislature, he was the proprietor and editor of the New Hampshire Spectator. In 1833 he moved to Washington, D.C. where he became Assistant Clerk of the U.S. House of Representatives. He was later appointed Clerk of the House of Representatives. 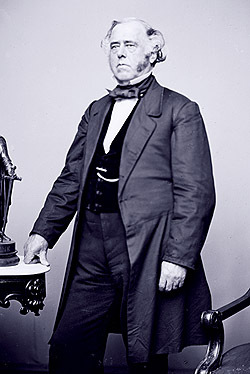 In 1847, Brother French became associated with Samuel F. B. Morse in the development and operation of the Magnetic Telegraph Company and was elected the company’s first president. He was appointed Commissioner of Public Buildings in 1853. Brother Benjamin B. French had a long and distinguished Masonic History. He was raised to the sublime degree of Master Mason on January 18, 1826. He was elected and served as Master in 1831, 1832, and 1833 of Corinthian Lodge New Hampshire. He also served as the Grand Marshall of the Grand Lodge of New Hampshire. On May 7, 1846 Brother French was affiliated with National Lodge #12 of the District of Columbia. On November 3, 1846 he was elected Grand Master of the District of Columbia and served for seven consecutive years. While Grand Master, he laid the cornerstones of the east extension of the U.S. Capitol Building, Smithsonian Institute and Washington Monument. Companion French was exalted in Columbia Chapter #1 Royal Arch Masons on November 5, 1846 and later served as Excellent High Priest of that chapter. He also served as the Most Excellent High Priest of the Grand Chapter of the District of Columbia. Sir Knight French joined the Washington Commandery #1 and served as Eminent Commander for 12 years. He was later elected Grand Master of the Grand Encampment of Knights Templar, U.S.A. Brother French became a Scottish Rite Mason and on September 15, 1859 he became the first 33rd Degree Mason from the District of Columbia. He was elected Grand Chancellor Supreme Council 33 Degree Southern Jurisdiction, U.S.A. Brother French had a fatal heart attack in 1870 and was buried at The Historic Congressional Cemetery, Washington, D.C.